Achieve a warm carnauba glow with Britemax! Britemax Vantage Premium Carnauba Paste Wax adds a warm carnauba glow to your vehicle. Featuring a blend of the finest carnauba waxes and high-tech polymers, this unique formula offers deep, warm carnauba glows with the durability that you need. Britemax Vantage Premium Carnauba Paste Wax is perfect on its own, or use it to ramp up shine and depth of your existing protection product! Die hard carnauba fans will tell you that there’s nothing like the real thing. They may be right, but they can’t deny the fact that carnauba unfortunately doesn’t yield the same durability that synthetic products do. That’s why Britemax Vantage Premium Carnauba Paste Wax offers the best of both worlds with a blend of the finest carnauba wax and durable polymers that provides carnauba-like shine that outperforms traditional carnaubas. Britemax Vantage Premium Carnauba Paste Wax gives you that warm carnauba glow you're always looking for! Britemax Vantage Premium Carnauba Paste Wax utilizes fine Brazillian #1 grade carnauba wax and fortifies it with the surface protection power of synthetic polymers. Not only will your vehicle look great, it will look great for longer than a vehicle waxed with traditional carnauba. 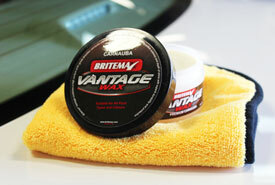 Britemax Vantage Premium Carnauba Paste Wax is easy to apply and one pot will cover as many as 40 vehicles! Blanket your vehicle in warm carnauba glow that will last with Britemax Vantage Premium Carnauba Paste Wax! Store in a cool, dry area out of direct sunlight with lid intact. DO NOT USE ON FLAT, MATTE, OR SATIN FINISHES. BEST Wax I've ever found.....I'm 65 and used about every new trick around...This is it.